APPLE PIE TENDER FOR MY TANZER 22. Day 16 of my little pram build. 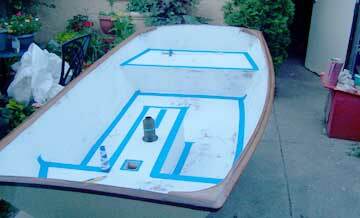 While the primer sets on the inside of the hull the daggerboard gets a handle. I've rescued lots of half worn lengths of lines that are still perfectly sound for this sort of use. The mast and spars get a coat of varnish. So far 3 coats. My short oars also get a sand and a varnish while I'm at it. The primer has now sat for a couple of days and is dry enough to sand. I'm using 220 grit disk. Experimenting with different materials for non slip. I prefer the middle sample that is coarse sawdust sold as kitty litter. 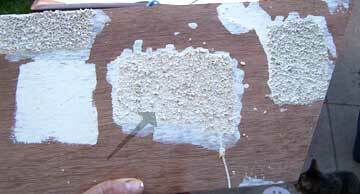 I've stuck a layer of material on wet paint and when dry brushed off the surplus. I then put a thin coat of paint on the material. I will be putting some non slip material on the seats and on the bottom. The blue tape masks the edge of the non slip stuff. I've sieved some of the sawdust and hope that it will make a less coarse covering for the seats. After rolling on a thick coat of paint in the non skid areas I've sprinkled the sawdust over the wet paint. If I like the looks of it I will keep the sawdust, if I hate it then I will have a jolly sanding session to remove it. The sawdust is a very coarse chunky material, not dusty at all. Worked on the rudder assembly. 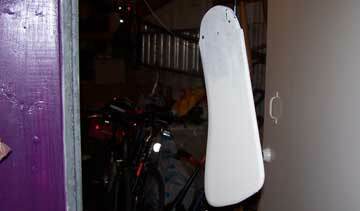 The blade got sanded and received a first coat of paint. The area inside the box will get a thinner coat of paint. There is not so much play to lift the rudder. I still have to make a tiller. Very angular chunky sawdust. 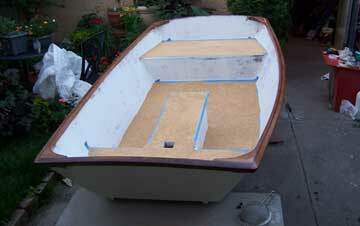 I'm hoping I can sand off the high points and have a nice no skid surface on the floor of the boat that I will paint. Some places sell crushed walnut shells and I think that would work very well. Today I have worked about 7 hours on the boat. Hard to tell, it was very warm and I took a lot of breaks. This brings the total to 109 hours. This web site reflects my personal ideas and doesn't represent anyone else's point of view. 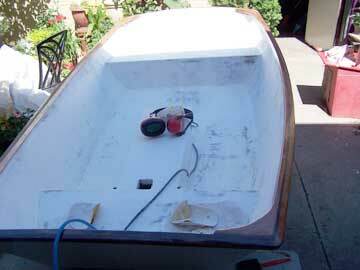 I'm not an expert boat builder and don't suggest that how I'm doing this is the best way, use your head.